I simply cannot get enough of them. Last time I was at TJ’s, I purchased five bags fearing I’d run out before my next trip. A bit obsessed I admit. This coconut isn’t that overly sweet, shredded stuff you might be thinking about. These chips are irresistibly salty and slightly sweet, crunchy goodness. True, coconut is high in fat and calories and might not be the best option for anyone trying to manage their weight. But I would suggest that if you get a hankerin’ for a snack, these would certainly be a better choice than a whole lotta other processed options available. 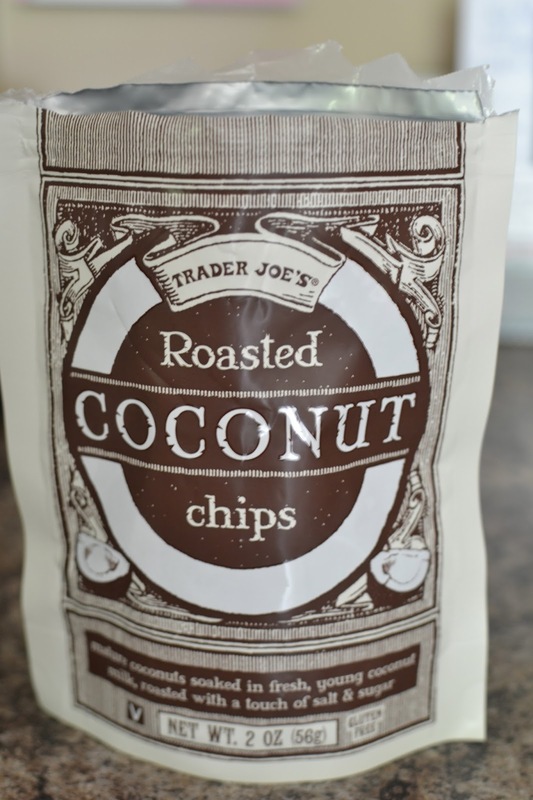 Besides munching on the coconut chips right out of the bag, I wanted to try them in baking. But until a few days ago, I was ovenless for about a month while waiting for a new oven to be ordered and installed. As soon as the installers had one foot out the door, I was preheating to make Sunflower and Coconut Muffins. These muffins combine several nutrient dense ingredients, making for a nourishing and fulfilling breakfast or substantial snack. Oh, and before you go, I want to sincerely thank everyone for their well wishes on the feature article published last week in the Let’s Eat section of the St. Louis Post-Dispatch! I am very grateful to Pat Eby for the opportunity! Preheat oven to 375 F. Place paper liners in muffin tin. Combine flours, baking powder, salt and cinnamon in medium mixing bowl. In a separate bowl, using an electric mixer, combine nut butter, sugar, oils, egg and vanilla. Slowly add in milk, then dry ingredients until just combined. Fill muffin cups about 3/4 full with batter; top each muffin with nuts and coconut. Bake 25 minutes or until tops are browned and inserted knife comes out clean. Note: muffins store nicely for months in the freezer. When ready to eat, thaw for a few hours or microwave for 25 seconds.